A lot of bloggers who work from home know the rut that you can fall into when you sit in front of your computer all day. It’s so easy to get into an unhealthy routine if you’re not paying attention to your habits. It’s more than just wearing pyjamas and slippers all day while you work from home — you need to set up a productive and healthy routine to get your through the day. You’ll want to get out of your chair and keep your body moving. You should also make a conscious effort to connect with people. Work on your self-care so that your mental health doesn’t suffer, as well as implementing healthy snacks instead of living off of coffee. Finally, you might try changing up your work environment to help with productivity and body aches. Deadlines can run your life for a blogger who works from home all day, and you can easily spend your whole day in your chair plugging away. However, it’s detrimental to your health to spend your whole day sitting. Make a conscious effort to get out of your chair and move in some way periodically. This might mean taking a walk outside or scheduling time at the gym. Or just setting a timer on your phone that reminds you to get out of your chair and walk around the house to get your body moving. Remember getting outside and exercising can also help to reduce stress, which can be another battle you face when working from home. Working from home can be isolating. A traditional job out of the house offers many things that a stay-at-home job does not, including a stricter routine, regular grooming, and social interaction. In order to help offset any feelings of being sedentary and alone, it’s important to maintain your social calendar. Make coffee dates with friends, talk to people online, or schedule date nights with your partner. This can help to decrease burnout, which can help you to be more productive overall. Everyone works a little differently, and bloggers who work from home all have their own positives and negatives associated with their work. Some feel comfortable and productive while others may feel stressed and isolated. Even if you find that working from home is the best choice for you, it’s still important to be rigorous about your self-care. This can mean using lavender oil to promote calm feelings and positivity. It can mean taking a shower each day even if you aren’t leaving the house. It can mean walking the dog each morning. Whatever works for you, it’s important to be mindful of your self-care. Some people may have issues with all-day snacking when they work from home. Others may forget to eat altogether. Some may be inconsistent with their eating. No matter what the case, it’s important to eat often and to eat well when you’re working from home. Create a routine and a meal plan that can help you to stay on track. Staying healthy at work can help you to be more productive and feel more fulfilled in your job. As a blogger who works from home, it’s even more important to watch your diet and eat healthy because of how much of your day is spent sitting, and how easy it is to skip a meal or eat unhealthy snacks. Sitting all day can be harmful for many reasons. Not only is it bad for your activity level to be sedentary all day, it’s also hard on the body. Many people who sit all day have issues with their posture that can be remedied with things like a posture shirt, a posture trainer, or a back brace to increase good posture. Meanwhile, some may experience issues with their elbows, knees, or neck due to prolonged sitting. Work on changing up your environment to help with these problems. You can try a standing desk, sitting at your kitchen table, or typing on the couch instead of at your desk. This change in environment can help with body aches caused by sitting in the same chair for a prolonged period each day. 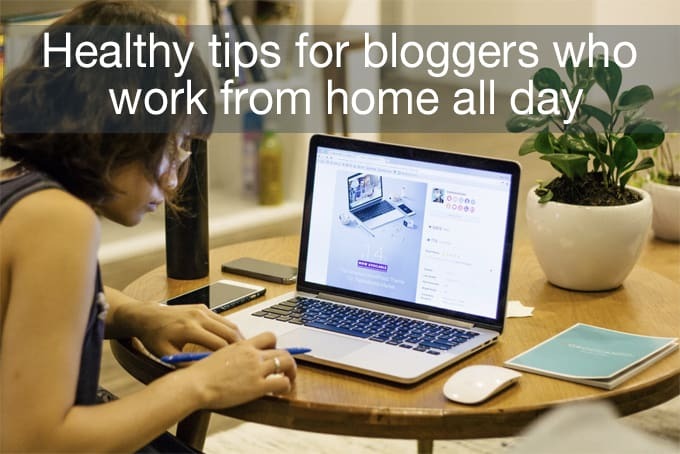 Are you a healthy work from home blogger? Bloggers who work from home all day know the struggles of remote work. These struggles include stress, issues with productivity, and poor health habits. However, there are ways to make a change in how you spend your work days. Just by focusing on your mental and physical health, you can reduce stress and increase productivity. Go outside, spend time with friends, take a break, eat breakfast, and spend half of the day at your standing desk, and your health will improve while you work from home. Nice and useful post. Thanks for the post.